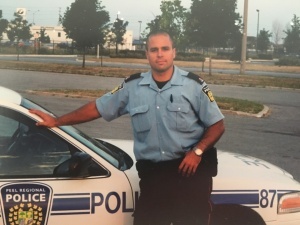 Constable Malcolm Wilson started his policing career with Peel Regional Police in 2000 on uniform patrol before moving to Durham Regional Police Service in 2003. Since that time Constable Wilson has served the community on frontline patrol, the Criminal Investigation Branch and Intelligence. He also worked at both Ontario Power Generation nuclear plants in Pickering and Darlington when DRPS was seconded to a security detail after the September 9/11 attacks. 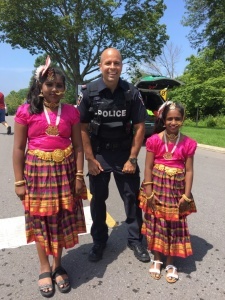 Malcolm has been involved with the ride since 2012 and took over organizing the DRPS contingent in 2016 and his experience with the Ride to Remember has been an ever-evolving journey. Initially, he signed up to show his respect to fallen officers, to build comradery among fellow officers and to enjoy his love for cycling. But on his third ride, the ride took on another meaning. He had his family meet him on Parliament Hill and when Malcolm rode in, he spotted his wife crying. She had been talking to an elderly woman whose son was killed in the line of duty in 1976. The woman shared with her how much it means that these officers ride in his honour every year and every year she attends Ottawa to watch them arrive. This experience deepened his connection to the ride and why he participates. Then in 2016, while training for the ride, Malcolm was caught in the rain and he took a terrible fall while crossing a metal bridge. Tearing open his knee and shattering his hand were just two of the serious injuries he sustained, causing him to miss the 2016 event. After undergoing four surgeries to repair his hand, Malcolm is back on full duties and was recently given the green light to begin riding again. Unsure if he’ll be ready to cycle along with his fellow officers, he’s making the trip regardless. On the investigative side, Constable Wilson was on the Project Empire team, which prevented a double homicide and resulted in a successful conviction. National media covered the case and the trial judge and crown attorney praised the excellent investigation, which resulted in a guilty plea. A second moment that still resonates with Constable Wilson was when he responded to the sudden death of a man, who left behind a wife and six children, ages seven to 18. Then, less than a year later and right before Christmas, the mother passed away from cancer, suddenly leaving the grandmother with six kids to raise. Malcolm leapt into action and organized some fundraising initiatives and was able to raise enough money for Christmas gifts and clothing, with some leftover to start an educational fund. And thanks to the generosity of those involved, he even managed to have a van donated to the busy family. To this day, Malcolm still keeps in touch with the family. On a personal note, Malcolm was recently recognized as Coach of the Year for his work with the West Rouge Soccer Club. He has been involved since 2003 and coaches the nine-year-old girls and 12-year-old boys teams.